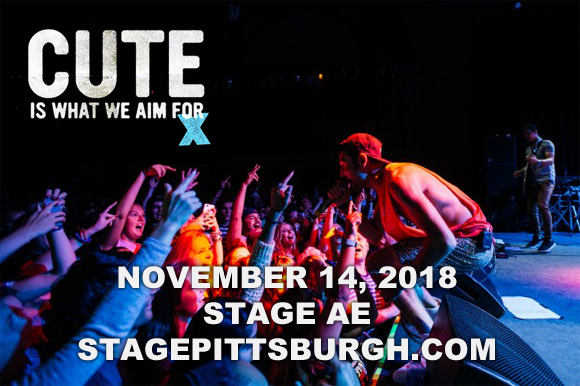 Cult power pop band Cute Is What We Aim For are headed to Stage AE on Wednesday 14th November 2018! The band, best known for their hits “The Curse of Curves,” “There’s a Class for This,” “Newport Living,” “Practice Makes Perfect” and “Navigate Me” will be supported by up-and-coming pop-punk act Makeout! “By the time we start this run, it will have been 18 months since Cute performed live,” LEad singe Shaant Hacikyan said in a press release. “I’m just excited to get back out there and put on a great show for the fans. We’re hoping to play all the classics and give everyone a little taste of some of the new stuff we’ve been working on. Power pop band Cute Is What We Aim For was formed in Buffalo, New York in 2005. Signed to Fueled By Ramen Records in November 2005, the band released its debut album, The Same Old Blood Rush with a New Touch, in 2006, which became Fueled by Ramen's fastest selling debut album. Their second album, Rotation, was released in 2008 and debuted at number 21 on the U.S. Billboard 200 albums chart. After a drastic change in lineup, the band released two EPs in 2010, before signing to Apparition Records the following year. 2012 saw a comeback for the band, with original members Shaant Hacikyan, Fred Cimato, and Jeff Czum playing together for the first time in six years. After another brief hiatus in 2014, the band reformed for a ten year anniversary tour of The Same Old Blood Rush with a New Touch in 2016, and continues to tour together in its original lineup.